Tech entrepreneur and Noodle.ai CEO Stephen Pratt is using data science, supercomputing, and machine learning to rid the world of waste. Stephen Pratt (’84) wants to make the world a better place, and he believes artificial intelligence (AI) holds the key. As Noodle.ai chief executive officer, he’s turning belief into action. With the world population expected to reach 11 billion in the next century, it is a global priority to efficiently use natural resources and allocate goods, Pratt says, whether that means food, water, or steel. Noodle.ai executives are determined to solve these difficult issues with the help of the Beast, the company’s sophisticated AI system that helps clients manage complex business operations and optimize decisions using algorithms and machine-learning tools. This AI-as-a-service model has been incredibly successful for the two-year-old startup, earning it many accolades, including its recent number four ranking on LinkedIn’s Top US Startups 2018, alongside firms like Lyft and Bird scooter. Based in San Francisco, Noodle.ai recently announced a $35 million round of funding from TPG Growth and Dell Technologies Capital. Clients include Big River Steel and private aviation platform XOJET. Despite Noodle.ai’s seeming overnight success, Pratt has worked on its underlying idea for years. Interested in control systems since his days at the McCormick School of Engineering, he used his skills serving in the Naval Reserve Officers Training Corps before joining Booz Allen Hamilton as a technology and strategy consultant. While working on satellite communications, he decided to earn a master's degree in the subject from the George Washington University. He later joined consulting firm Deloitte, where he rose from entry-level partner to a top-level partner in just six years, the only person to have done so at the time. He began helping clients implement technology in customer relationship management, sales, and marketing with teams based in the US and India. Seeing the potential for a globalized approach to technology consulting, Pratt approached Infosys about starting a consulting subsidiary. After getting the green light, he and frequent business partner Raj Joshi launched Infosys Consulting in 2004, going from a two-person startup to a company with 32,000 employees and $2.3 billion in revenue in 10 years. 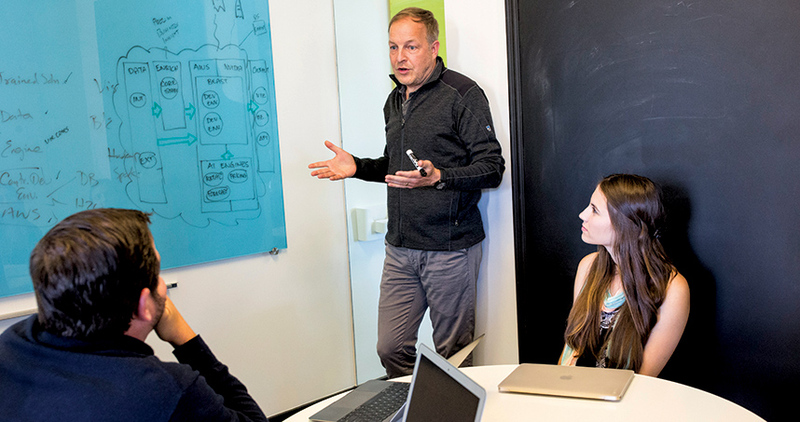 The company’s success is the topic of case studies taught at Stanford University and Harvard University business schools, and Pratt has twice been named one of Consulting Magazine’s top 25 consultants in the world. In the meantime, a friend from IBM asked Pratt if he was interested in running all of the Watson implementations worldwide for IBM Global Business Services. While the work was interesting, Pratt quickly realized that he wanted to work with a broader, more nimble technology. He reconnected with TPG and crafted an agreement to fund the kind of company Pratt had in mind, a firm using both learning algorithms and business operational expertise to solve problems. He called up his Infosys Consulting collaborator Raj Joshi, and soon after, they launched Noodle.ai. Clients subscribe monthly to use Noodle.ai’s computing platform, which utilizes machine learning tools and algorithms to help them make their businesses more efficient and cut waste. XOJET increased profitability by using Noodle.ai’s expert analysis to price flights better, while Big River Steel sold excess energy by predicting how much electricity it needed. Noodle.ai’s goal is to hit $100 million in revenue by 2020, but financial success isn't the only motivation. Pratt feels AI has great potential to improve our environment and society. Pratt’s Northwestern roots are strong—it’s where he met his wife, Edie, a neurosurgeon who studied in the Honors Program in Medical Education (’85, ’87), and where his daughter, Abby, is currently a McCormick sophomore creating her own major in computer science and behavioral economics. He taught both Abby and his son, Adam, important lessons from Northwestern, like the importance of combining creativity and abstract thinking with technical knowledge to develop unique ideas. He endorses Dean Julio M. Ottino’s whole-brain approach to engineering.